« Centralism and Unitary State Logic in Iraq from Midhat Pasha to Jawad al-Maliki: A Continuous Trend? Sistani and Maliki: Towards a More Active Role for Najaf? 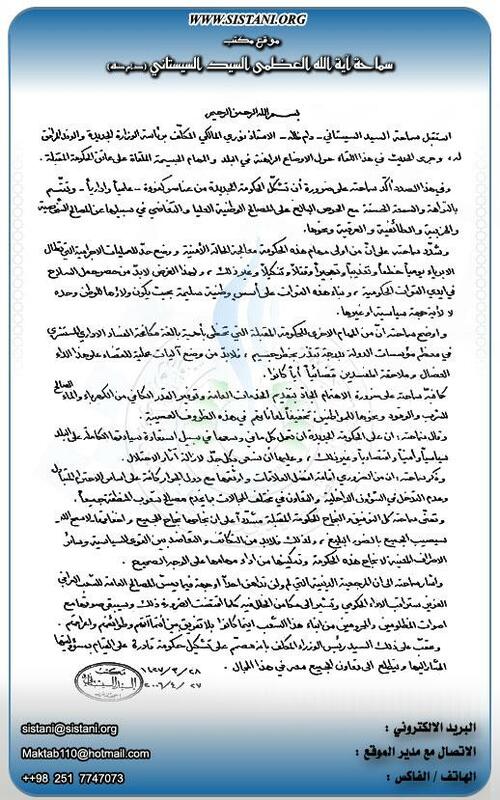 On 27 April 2006, the Najaf office of the Grand Ayatollah Ali al-Sistani released a pronouncement or bayan which may be of greater import than any other document issued by Sistani since October 2004.The new pronouncement, published after a meeting held with prime minister designate Nuri (aka Jawad) al-Maliki, may mark an end to a long period of silence from Sistani. After an interval of active involvement from June 2003 to November 2004, the Najaf ayatollah has in the subsequent period been distinctly hesitant with regard to direct interference in Iraqi politics… Full story here. This entry was posted on Saturday, 29 April 2006 18:19 at 18:19	and is filed under Iraqi constitutional issues, UIA dynamics. You can follow any responses to this entry through the RSS 2.0 feed. Both comments and pings are currently closed.